So as I start this, it’s four minutes until my birthday. I’ve already had my first kind birthday wish from someone in another time zone and the children are all asleep while I catch up with work. Earlier in the week I was reading Adele’s rather lengthy explanation about exactly what her notoriously difficult third album is about and it got me thinking about how my life has changed. I was married at 25. I spent many hours of that year angsting over lace patterns, china patterns, my dress size and seating charts. Being married and the support of my DH gave me the confidence I needed to change my career and start again. I spent my 26th birthday on my first day of work experience at a magazine. Malcolm Gladwell reckons it takes 10,000 hours to make someone an expert and I’ve certainly put them in over the last twelve years. Many many hours spent on the phones, going through clips, checking Lexis for old stories to revisit, at press launches for random items, writing copy for competitions that few fancied, engaging with community users about what they love and moderating arguments about topics that many really don’t care about followed that Monday spent making the tea. I certainly never imagined that by this age, not a milestone in anyone’s book, that I would have four small children and a fledgling business of my very own. I would have done it sooner but you know, life happened. Picture the scene. Finally all the children are in bed and my husband and I are snuggled up on the sofa about to watch something on Netflix when we hear a thump, followed by tears. Our youngest child is a complete gymnast and she’s managed to get out of her cot. The whole game has changed. Both she and her sister have up to now been pretty good at going to bed – we have a routine of sorts in as much as they have a beaker of milk, listen to some plinky plonky lullabies on Spotify and you hand them the correct teddies in order and they’ll both usually head to the Land of Nod. But now we are going to have to deal with the ability to get OUT of the cot. Our plans are to change the cot to a cot-bed and put a stair gate on the door, remove any furniture on which she can climb (see previous reference to gymnastics) and hope for the best. We anticipate quite a lot of Tanya Byron’s Rapid Return. We have a trip to the Bedruthan Steps hotel planned next week – and we think we will have them both in beds then, so it could be that the honeymoon period is over….watch this space and wish us luck. This day last year I rode in my first cycling sportive, in Loseley Park, in Surrey. I was very nervous and unsure what to expect. This blog has a fair amount of the story of how I got involved. As it happens, as it was a women only event, with bike hire and mech support laid on, it was brilliant, with a supportive vibe, fun stuff for my kids to do while they awaited my return and a VIP cool down area afterwards. I met the incredibly inspiring Victoria Pendleton that day. Since then, I’ve signed up to the longer distance event at Woburn which was beautiful and a LOT less hilly, thank God. Though my chain fell off far more times than I’d like to remember, I completed it without injury despite having taken the training a lot less seriously than for my first ride – I was perhaps a bit more confident, maybe even over-confident once I knew the set up a bit more. In addition to the cycling which can be rather a lonely thing to do, I’ve also undertaken to do a lot more exercise, realising that those endorphins really are marvellous things at giving you energy and clarity in your life. I finally found the kind of exercise I enjoy – short sharp HIIT classes with other people for chit chat and companionship. These are done OUTSIDE rather than in front of a mirror or numbing your brain while pedalling or trudging on a treadmill watching misogynistic music videos or a soap on the telly. I’ve lost nearly a stone in the process and even managed to buy a size 10 dress – something I never ever imagined. I thought I’d be a 14 for the rest of my life. I’m writing this because in the last few days, a sentence sprang from my lips that I could never have predicted. A combination of diary clashes means that I won’t be able to get together with the relentlessly cheerful and motivating PT who runs the exercise classes I attend and who has been helping me over the summer too. I was that person who genuinely counted running late as exercise, so for me this is a huge u-turn. If you’re the kind of person who never thought that they could get off the sofa and get on with it, let me assure you it’s possible. 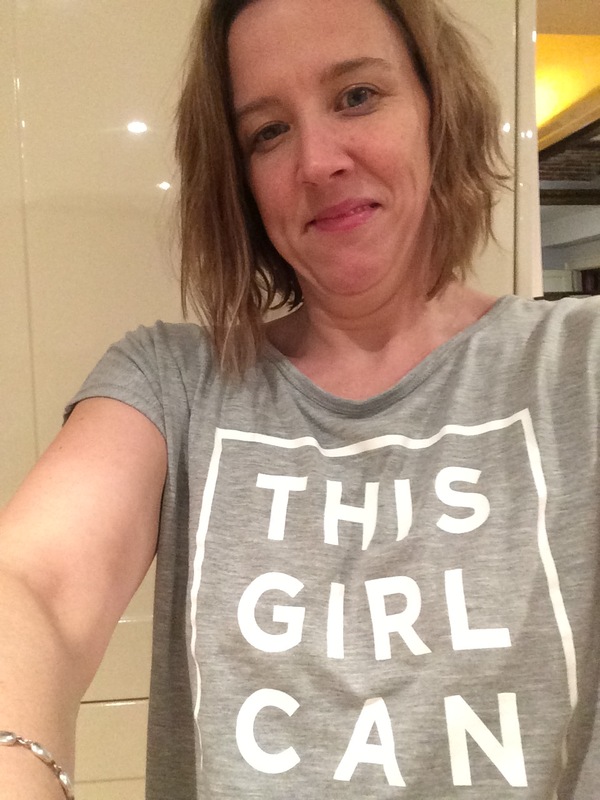 This is why I’ve bought my #thisgirlcan t-shirt. I am not only wearing it, I’m living it at every opportunity.